Are you ready to quit the daily grind? Or maybe you’ve already become your own boss, but you’re struggling to match your old pace or worried about meeting your new quotas. If you’re one of the millions of people working from home (one in five Americans work from home, according to Forbes), here are four useful tips to ensure that you’re making the most out of your self-directed workday. The television is blaring from another room. The neighbors are mowing their lawn outside your window. There are a million distractions around the house that can prevent you from having a productive workday, so it’s your responsibility to head them off at the pass. Close the doors; shut the windows; don’t leave your office until your work is complete. Try to give yourself structure and not opportunities for laziness. Take a cue from Nobel laureate Gabriel Garcia Marquez, who would dress up to work every day. Even though he could have just written his masterpieces in his underwear, he took his job seriously and dressed accordingly. History proved that his habit was right. Having the right tools is half the battle of working from home. For example, if you’re handling your own invoices, you might need something like freelance invoicing software (https://www.streetinvoice.com/freelancer-invoice-software.html). If you’re drafting budgets and schedules, you’ll need to conquer spreadsheet programs. You can’t go to battle without your weapons, so don’t try to get any work accomplished until you’ve gathered all your work tools. Take advantage of the latest cloud-based tools, which allow you to track your time, invoice clients, and set up meetings not only from your computer but also from your smartphone or tablet. Keep the receipts of any equipment, service, subscription, or tool that you buy for your business, more on that later on. It’s easy to procrastinate when a little voice in your head is always saying “you can do it tomorrow.” Squash this urge by giving yourself clear and relevant goals each morning when you first sit down at your desk. Do you need to complete a certain amount of forms? Are you expected to make a certain amount of calls? Tell yourself that your workday isn’t finished until your daily tasks are. Going back to the example of Colombian writer Garcia Marquez: he had his daily as to complete one full page of the novel that he was working on. He would force himself to complete that one page every single day until his novel was complete. Why would you spend additional money in renting out office space and wasting time commuting to that office? You’re already paying for rent and utilities at home, so you’re better off using that sunk cost to establish a home office. Additionally, this goes hand-in-hand with limiting interruptions and keeping yourself focused. If you’re trying to work at the dining room table, you’re opening yourself up to delays and distractions from the world around you because you aren’t in the “working” mindset. Barricade yourself in an office where you’re surrounded by pens, papers and files that will remind you of what you should be doing instead of idly browsing Facebook every five minutes. At the same time, having a well-defined home office allows you to calculate the square footage with much ease. Having the square footage of your home office is critical to allocate the right amount of deductible home expenses to hour home-based business. I wrote a great guest post at SellOutYourSoul.com on how to keep more efficient track of revenues and expenses, and what tools and templates make billing and budgeting easier. Figure out your total expenses and take off any unnecessary expenses. If you’re planning to become a full-time freelancer, you’re going to have to learn to optimize your cash flow. Without a continuous cash-flow, you’re more likely to end up racking up credit card debt. 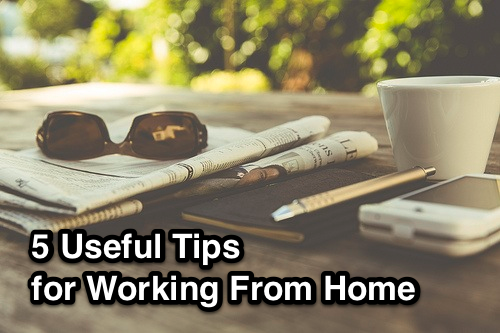 These are just a few tips for increasing your productivity while you work from home. It may not always be an easy thing, but as long as you’re committed and hardworking, it can be extremely worthwhile.